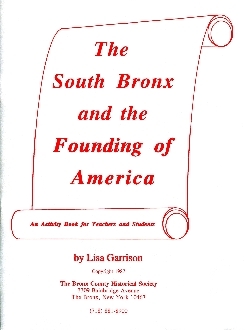 "The South Bronx and the Founding of America" has been written and designed specifically for use by teachers and their students in Grades 4- 6. It provides a concise historical account of the early settling of The Bronx interwoven with examples of creative teaching ideas to support teachers in their curriculum development process. While written about The South Bronx, many of these ideas are pertinent to both the borough and the city at large and were designed to be easily adapted to the exploration of local history in other communities. Included in the text is the definitive account of how the borough got its name. Students can use maps and charts that show how people of African heritage arrived in The Bronx and doubled the percentage of their population in 300 years. They'll read about a girl in colonial America who had trouble getting along with her family and learn about a Puerto Rican Bronxite who writes poetry inspired by a monument to people who helped establish the United States of America. As a sourcebook for developing local history curriculum in the classroom, "The South Bronx and The Founding of America" synthesizes 10 years of historical research on the part of The Bronx County Historical Society. Its development grew out of an Interdisciplinary Arts and Social Studies program on the U.S. Constitution offered by The Society in elementary schools in Community School District 9.